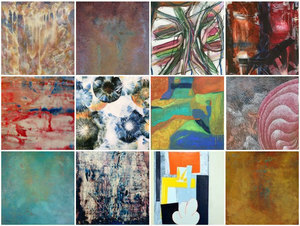 Ridgefield Art on Main announces our next exhibition of abstract art entitled MINDSCAPES. Artists: Eleanor O'Keefe Anderson, Heidi Lewis Coleman, Charles Gulbrandsen, Jennifer Glover Riggs, Frances Goulart, Richard Danzig, Luiza Budea, Alice Hayes, Iulian Budea, randi Nussbaum, Daniel W. Barett Ph.D., Philip Pollak, Viorica Ghetu-Vuono. It is no secret that artists often put a part of themselves into their work. Mindscapes seeks to juxtapose a variety of abstract artists in order to reveal their individual personality and character as expressed through their paintings. Just as handwriting can be interpreted by experts to reveal the individual traits of the author, so can abstract art can be very telling about the kind of energy and emotion artists choose to project.